You can also include an “about” video for your course. A course about video appears on learner dashboards to market your course. For more information, see Adding a Course About Video. When you upload an .srt file, a .txt file is created automatically. You can allow learners to download these transcript files. 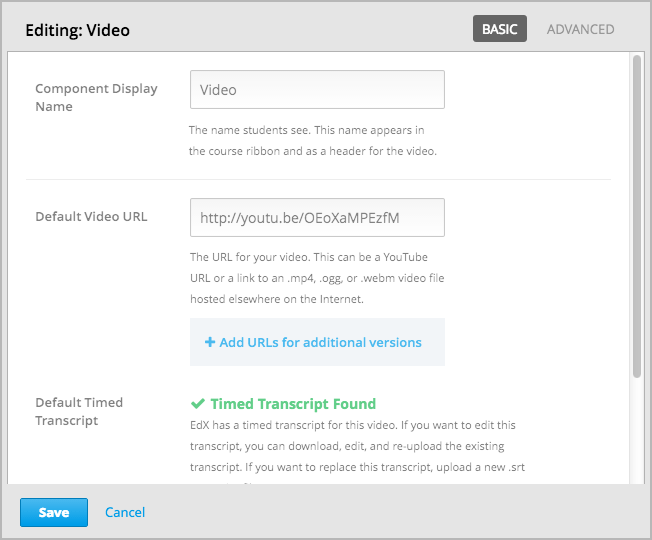 If you allow your learners to download transcripts, the video player includes a Download transcript option. Learners can then select either SubRip (.srt) file or Text (.txt) file to download the .srt or .txt transcript. The license options that you select control the copyright notice that learners see for the video. For more information, see Licensing a Course. By default, a .txt file is created when you upload an .srt file, and learners can download either the .srt or .txt transcript when you set Download Transcript Allowed to True. Download Transcript appears below the video, and learners see the .srt and .txt options when they move the cursor over that option. To provide a downloadable transcript in a format such as .pdf along with the .srt and .txt transcripts, you use the Upload Handout advanced setting. When you do this, Download Handout appears to the right of the Download Transcript in the video player, and learners can download the .srt, .txt, or handout version of the transcript. To add a downloadable transcript, follow these steps.